Overnight campouts at the zoo are an annual favorite! The evening is chock full of activities, including a barbecue, live animal show, crafts, campfires and s’mores. Campers must bring their own gear and EPZ will supply dinner and breakfast. The rate is $40 per person and members receive a 10% discount. Children must be at least 2 yrs. of age. Register Now! Space is limited and fills up quickly. 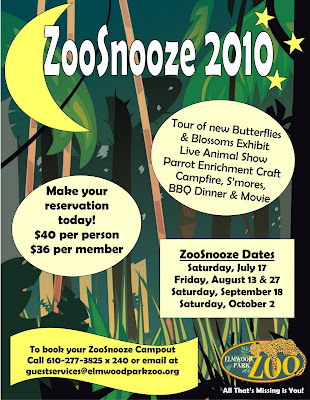 The first ZooSnooze is July 17 and registration closes July 14. Click here for more information. To register, call 610.277.3825 x240.